We follow the philosophy that if you're unable to safely eat/digest something, then you don't want to put it on your skin. Most of our soaps are made with ingestible products, even down to the lye that we use, which is food grade. 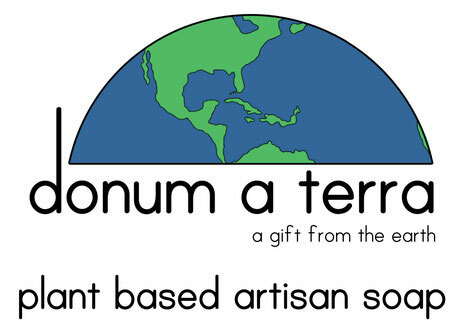 We do have some earlier made soaps with non-edible ingredients, but we have since re-worked the recipes in order keep with our ideals, and are in the process of phasing them out. All of our plant-based ingredients are in green text, earth-based ingredients in blue, and the ingredients to be phased out are in black text. How long will the soaps last? That'll vary on the soaps' individual hardness, the number of people who use the soap, and the frequency of use. One way to prolong the life of your soap is to set the bar in a place where it can dry completely. Soap dishes without ventilation will shorten the life of the soap especially. Another way to extend the use of your soap is to cut a smaller piece from the bar to use immediately and store the rest for later use. All orders are processed within 1-3 days. We charge a flat shipping rate of $7 and send orders via USPS Priority Mail (excluding wholesale). Wholesale orders require purchaser to pay for all shipping costs. Shipping times will vary based on rate selected by purchaser. Unfortunately, we only ship within the United States at this time. What is your return/damaged policy? Your satisfaction with a purchase from us is very important. If, for any reason, you feel you did not have your expectations met, please contact us. All cases are individually reviewed and addressed. In general, we do not accept returns or exchanges. I have an additional purchasing or business related question. Any questions you have about purchases, or purchasing our soaps, you can fill out our contact form located on our site here. Our soaps are simply soaps. Our intent is to provide people with a plant-based alternative to bathing and cleaning with common, store bought detergents. Any additional uses of herbs or essential oils are for variances in texture, color, and scent. We do not claim our soaps prevent or cure any health issues or diseases. They will, however, leave your skin clean, and increase your desire to shower or bathe.